During the winter, when people spend most of their time indoors, they often complain about frequent headaches and dryness of the skin. Easy way to solve this problem is to make a green wall. Besides the decorative, the purpose of placing a green wall is oxygen-enrichment of the space, purification of internal pollutants and allergens (we all know how important is to have a clean home) and increase in humidity. People who live or work in areas with vertical gardens are less sleepy and more concentrated. If you want your vertical garden to be healthy and lush it is essential to combine compatible plants as well as taking into account factors such as exposure to the Sun and weather conditions. Preparation for green wall installation should be thorough, the walls have to be waterproof and it is necessary to take into account the dryness of the surrounding walls, floors and ceilings. Green wall consists of a fixed or movable supporting structure, space for plants (which is made of special multi-layer fabric) and irrigation system (pump, tank for nutrition and water, a timer and a dropper). Firstly, you have to attach a metal structure that will support your vertical garden to the designated wall, then conduct watering system on that structure, but make sure that each plant gets enough water. After that, set the waterproof fibers that insulate the wall from moisture. All you have to do next is to stack your plants next to each other in straight lines or curved ones, depending on what kind of atmosphere you want to create. If you are wondering, yes, there is an easier and cheaper way to make your green wall; all you need is a vertical garden kit. The kit contains a plastic panel (frame) with different number of pots for your plants and water pipes for watering the entire frame. Creeping philodendron, Dracaena, ivy, Chlorophytum, Scindapsus, Ferns, Spathiphyllum, Aglaonema and plants with small root system are recommended for cultivation on the vertical gardens. You have to combine plants that have similar needs for light and water, but have a different color or structure of the leaves. Besides flowers and other greenery, your green wall can contain different spices, so you can think about brightening up your kitchen with this mini garden. The frequency of watering and fertilizing depends on the plant species and conditions in the room. You should make sure to regularly inspect plants for overall health, moisture levels, pests and disease, trim and clean of all foliage as necessary, check water level in the tank, check pumps and timers and clean filters and replace any dead plants or failed irrigation components. Maintaining an internal vertical garden takes a little more effort comparing to the outside green walls, because the plants inside are not naturally exposed to the Sun rays as much as those outside. 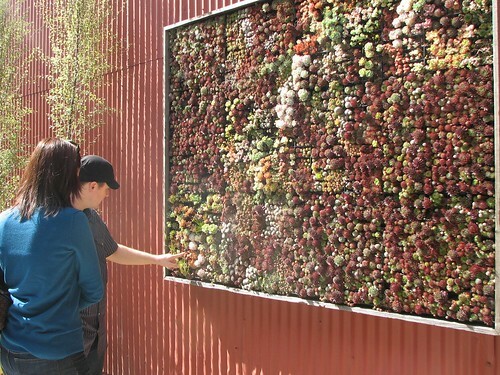 A lot of studies that have shown that vertical gardens are not just a fad. In fact they have shown that vertical gardens planted in hospitals, mental institutions, rehabilitation centers and nursing homes have a positive impact on the people who spend time there. Longer stay indoors have a bad psychological impact on people, so bringing nature inside will definitely help to lessen that influence.